Did you know that outside of London there is a Southgate in Denmark, and three in Scotland? There’s one by Wigan Pier and one in Cheadle. There are 7 gates in the City of London and one is the odd one out? Can you make a 10 letter word out of Cristiano Ronaldo? Can you say who was the youngest ever goal scorer in World cup history? We can! 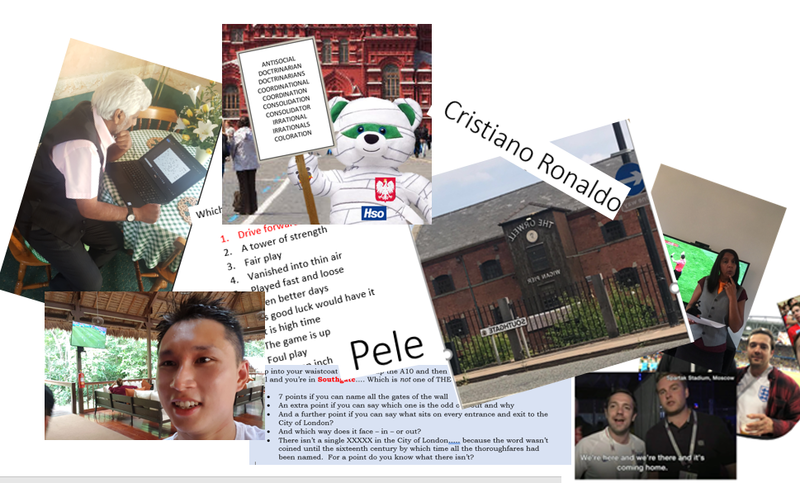 HSO ran a football charity competition with all of the puzzles, challenges and ridiculous teasers tenuously, (oh so tenuously) linked to the World Cup. Over the course of four weeks, to a man (and woman), to score they played hard, persistently broke every one of the dubious ‘rules’, pondered on brainiac puzzles, modelled waistcoats, built jigsaws and played Guess Who? There was pleading, penalties, blatant showboating, a couple of nutmegs and a few requests for a recount. Points were highly sought after, all in the interests of others. HSO is very proud to donate £500 to MacMillan Cancer Support on behalf of ‘Team Francky goes to Russia’, the winners of the HSO 2018 World Cup Charity Challenge, who secured the highest number of points. Second team ‘Fiery Samurai’ won £300 to donate to their chosen charity The Down Syndrome Association and joint third team ‘No need for HR when you have VAR’ have got £50 for Great Ormond Street Hospital with ongoing support. Also in joint third, ‘Mustapha Kepa’ earned £50 to buy Mosquito nets for a village in Uganda. A further £100 was immediately donated by employees moved to hear that every £50 saves at least 10 lives of vulnerable children and adults from the blight of malaria. So ‘it’ didn’t, after all, come home this time – but what a fabulous four weeks? And HSO people showed that when it comes to competing, teamwork, being involved and being prepared to work hard to get it over the line, HSO really is world class. With the exception of the team names!